Drinking Ionized, Alkaline, Kangen Water Has Changed My Life! I was introduced to the gift of ionized, alkaline, kangen water made by the Enagic machine. I went from fatigued and dragging through the day to being able to function and get a lot done everyday in just a few days! My body was feeling desperately thirsty all the time no matter how much I drank. I never felt hydrated. A friend gave me the water and I could feel right away that the water absorbed and I started feeling a lot more energy. Also, I tore my left knee tendons...they were a miserable thing to live with. After a few weeks, I am no longer needing the brace. I was told it would take 6 months, I am walking just fine in 2 months! I am happy to share my testimony about the water with anyone. You can also learn more about the water and how many people have changed their lives, by simply "drinking the water". There are great videos, including Dr. Shinya's work with patients and colonoscope views of how things changed inside with 90 days of drinking this water. Remember, disease can NOT thrive in an alkaline body. Thank you for sharing your experience with drinking ionized alkaline kangen water. I've read some good things about kangen water, of course. I personally have purchased the water filters from Aquasana for my own family's use. But the benefits of the kangen water seem to be well documented. If there are people interested in trying alkalizing ionized water similar to the kangen water for themselves but can't afford the enagic machine, I would recommend the KYK Harmony Water Ionizer. The KYK is a fraction of the cost of the Enagic brand that you mentioned using, but the quality is very comparable, in my opinion. It's my guess that the Enagic machine is a lot more expensive because of the MLM method of marketing. Costs have a tendency to be very inflated to cover the 'levels' of company members commissions. For those wanting to drink healthy alkaline, ionized, water at the best price take a look at the KYK Harmony at Water for Life USA to get the best deal. Below is a video that shows some before and after footage of patient's colons who were given the ionized, alkaline Kangen water to drink. It's a bit, gross, of course, so don't watch it if you're squeamish. Comments for Drinking Ionized, Alkaline, Kangen Water Has Changed My Life! Only Enagic Produces Kangen and it is DIRECT SALES, not MLM! There are a couple of things that I would like to point out regarding Kangen Water. First, the word "Kangen" is the registered trademark belonging to Enagic. No other water ionizer may legally use this term. --- I have personally spent over 300 hours of research diving into every ionizer made. I can tell you that some the Kangen Water units made by Enagic (prices from $1280-$3900) are more expensive, not because of the different levels of pay, but because of the quality of the unit. OF COURSE, every item on the market has a mark-up for marketing costs. Today, I found an ad that said, "Dont waste your time with Enagic, make more money with KYK!" I called asking about the pay to KYK distributors and found the markup of the machine manufacturing costs and all the middle men down to the last person involved in the sale is the same mark-up percentages that Enagic has. Please do not be MISLEAD into thinking these ionizer are the same, one for less money. That is a ploy that other manufactures use to detract from the inferior product they make: they cannot attack the way Enagic's system is made, the water it produces or the certificates and awards it owns... so they have to find SOMETHING to say! I have personally looked at the Engineering in detail, the metals, the transformers, the plates, the power systems, etc... and Enagic simply is the standard to beat - which is why other ionizer companies use Enagic's name to try to market their product and then say they are the same water for less. Does this not raise a red flag?? Only Enagic makes Kangen water. Other ionizers make an ionized water, but there are HUGE differences. I have personally tested most models on the market and have some shocking results! 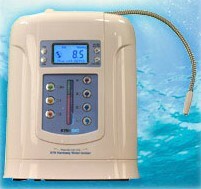 Enagic's SD501 ionizer is the leading ionizer on the market, which is why everyone compares themselves to it. It is endorsed as a medical device in Japan... I have personally overcome Firbromyalgia, Epstein-barr, chronic fatigue, chronic migraines and heavy metal toxicity on Enagics water. In three months!! Most info on the web regarding ionizers are not accurate! Please ask yourself why they are comparing to one company... ask the company to produce the medical certificates they claim... do the math on plate size and material used... is it in cm or inches... does it add up?? Is mesh, or slotted or solid plates better...solid of course, I can explain why! Transformers are the most stable... the units used in hospitals use transformers... and there are reasons for it! Just a couple of suggestions... hope they help! Thank you for your very informative comments regarding your research into Ionized water. I'm always happy to have our visitors share their experiences to encourage one another. Multi-Level Marketing isn't a bad word, even though it has developed a bad rep over the years, so you don't need to feel defensive on that account. Even though Enagic can be considered Direct Sales (as many MLM's are), it is also considered MLM because the compensation plan pays "8 levels" deep, making it "multi-level." That's great and nothing to be ashamed of, particularly for those who are interested in taking it on as a business venture. There is a right way and wrong way to build a business no matter what the business model is, including Direct Sales and Multi-Level Marketing. Since you didn't attempt to leave a url for a website of your own, I assume you don't have one as yet to promote your Kangen water. The fact that you are very knowledgeable and passionate about the subject and that you have a wonderful testimony and story to tell is to your great advantage. You could do very well for yourself by building a website completely devoted to the niche of ionized water/healthy water, etc. You would then have your own very targeted visitors seeking out the information you are offering. You would be able to genuinely help others and earn a living for yourself through something you truly love and believe in. That's what I do here with my site. I never would have known how to do it successfully if I hadn't run across SiteBuildIt. I think it would serve you well to look into it to help you grow your business in a good way. If you have any questions, feel free to use my contact form and I'll do my best to help you out. I'm very pleased to hear how you have been helped by drinking the ionized water. It just goes to show the importance of healthy water for the body and the benefits that can be gained by trying it. Hey! I'm a believer in ionized alkaline water! It has helped me already and although I do own a machine from Enagic, I do beleive there are other good machines out there. I just wanted to restate what I saw in another comment. "Kangen" is a trademarked name for the water made from Enagic machines and I just suggest not using it when mentioning other brands. I just dont want you to get in trouble because I know they are really sticklers about their term "Kangen". I truly feel you are trying to help people with your website and I wish you all the best, I just dont want to see you get into any legal trouble for misusing the trademarked term Kangen. God bless you in your endeavors! Thank you for clarifying the Kangen and Enagic connection. Apparently "Kangen" is the name that Enagic has chosen for their ionized water. As you mentioned, there are various water ionizers on the market today. Most claim that theirs is the best. It is always the burden of us, the consumer, to do our "due diligence" in determining which brand of a product is the right for us in the area of quality and affordability. I appreciate good quality, but I've always been in a position to look for the best value for my dollar, too. The word "kangen" means "return to origin" in Japanese. Thank you for pointing out once again the trademark issue/concern. For any/all interested... Kangen is a trademarked name for the ionized water produced by the Enagic machines. Ionized alkaline water is available and can be produced by other good quality machines, but perhaps we should avoid using the word kangen interchangeably with ionized/alkalized water. Just recently however, these websites are becoming more numerous, thought-out and damaging. Enough so that in defense of the honor of our Company & Distributor Network, letters of protest are being formally sent from our legal counsel due to defamation and criminal business obstruction. Kangen Water® is our trademark, and it is illegal for other companies to copy or use it. Enagic's line of business is now expanding globally and because of the huge market being cultivated by our distributors, our competitors from countries around the globe are trying to copy our product. Competition is good for business and is welcome, but we feel it is with childishness and malignancy that our company is criticized. The claim made by other companies that their products are equally certified or of equal quality is extremely questionable, if not an outright fallacy. Furthermore, Enagic USA is a proud member of the very prestigious DSA (Direct Selling Association) and as such, follows closely the stringent and non-negotiable ethical standards established by the DSA. Our policy is to expand our business with honor and fairness with our competitors in this quickly-expanding global market. In spite of the less than honorable ethics and business practices used by our competition, Enagic will continue be the premier and paramount manufacturer of water ionizers and health supplements in the world. Staying true to the philosophy of President Oshiro will ensure that Enagic will continue its rapid growth and amazing success for decades to come.